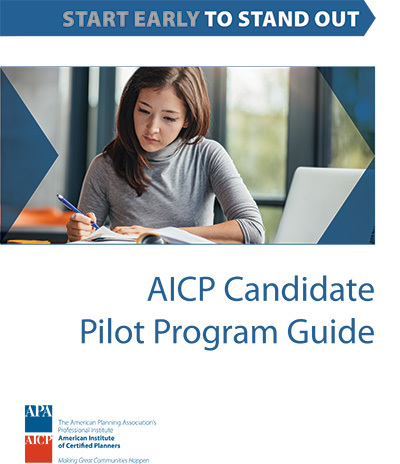 This guide provides details about the AICP Candidate Pilot Program, including enrolling in the program, signing up for a mentor, and registering for and taking the AICP Exam. Be mentored by an experienced AICP member. Participating in mentoring is optional but highly advisable. Begin to earn and track Certification Maintenance credits by participating in educational programs and events. You must earn at least 16 CM credits (including 1.5 each in law and ethics) before you can apply for AICP Certification. Check out program-specific resources to help you prepare for the AICP Certification Exam.